In 1995, the percentage of African-American players on the Cardinals was above the league average. In 2009 it was one-fourth the league average, and as the 2010 season begins there are no African-American players on the Cardinals roster or coaching staff. Below is a partial chronology of important events in the history of African-American players on the Cardinals. The first African-American to play for the Cardinals was Tom Alston in 1954, seven years after the major league color barrier was broken by Jackie Robinson and the Brooklyn Dodgers. There were African-American players on the Cardinals during the final thirteen years of the first Busch Stadium (Sportsman’s Park). In 1964, the Cardinals defeated the New York Yankees in the World Series, four games to three. There were at least four outstanding African-Americans on the team: Lou Brock, Curt Flood, Bob Gibson, and Bill White. Brock and Gibson are in the Hall of Fame; Flood paved the way to free agency for players, and White became president of the National League. In 1995, journalist David Halberstam published a book about the 1964 World Series. It was called October 1964. The 1964 World Series between the Yankees and Cardinals was coated in myth from the get-go. The Yankees represented the establishment: white, powerful, and seemingly invincible. The victorious Cards, on the other hand, were baseball’s rebellious future: angry and defiant, black, and challenging. Their seven-game barnburner, played out against a backdrop of an America emerging from the Kennedy assassination, escalating the war in Vietnam, and struggling with civil rights, marked a turning point–neither the nation, nor baseball, would ever be quite so innocent again. There were African-American players on the Cardinals all forty years that the team played in the second Busch Stadium (1966 – 2005). The Cardinals won the National League pennant in 1967 and 1968. In 1967 they won the World Series. Among the African-American players on these teams were Brock, Flood, Gibson, Al Jackson, Alex Johnson, Dave Ricketts, Ted Savage and Bobby Tolan. In 1975, the percentage of African-American players in the major leagues was 27%, the highest in the history of the game. The Cardinals won the World Series in 1982 against the Milwaukee Brewers. Among the African-American players on the team were George Hendrick, Tito Landrum, Willie McGee, Lonnie Smith and Ozzie Smith. There have been only four African-American players on the Cardinals since moving into the third Busch Stadium in 2006. They are Brian Barton, Joe Thurston, Rico Washington, and Preston Wilson. None of the four has been a consistent starter. The Cardinals won the World Series in 2006 against the Detroit Tigers. Preston Wilson was the only African-American player on the team. In 1996, the first year that Tony LaRussa was manager of the Cardinals and Bill DeWitt, Jr.’s syndicate owned the team, 24% of the players on the roster were African-American. This was both 7% greater than the major league average for that year and 7% greater than the 1995 Cardinal team under previous ownership and management. The 2006 championship team was 2.44% African-American. The league average that year was 9%. 2007 was the low-point of African-American players in the major leagues since integration. 8.2% of the players in the League were African-American; 2.22% of the players on the Cardinal roster were African-American. 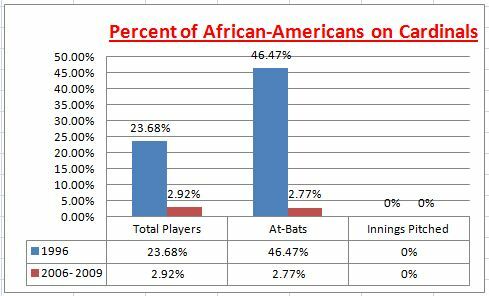 On opening day, 2010, the percentage of African-Americans on the Cardinals was 0%. For the first time in years, there was also no African-American on the team coaching staff. We do not have figures for the entire league. In the history of the third Busch Stadium, 5,761 innings have been pitched by Cardinal hurlers. Not one pitch by a Cardinal has been thrown by an African-American. In the history of the third Busch Stadium, 4.89% of the Cardinal at-bats have been by African-American players. In 1996, the first year with DeWitt as owner and LaRussa as manager, 41.33% of the Cardinal at-bats were by African-American players. Change happens for better or worse. Link to article on “St. Louis Baseball in Black and White” on Corresponding Fractions blog.